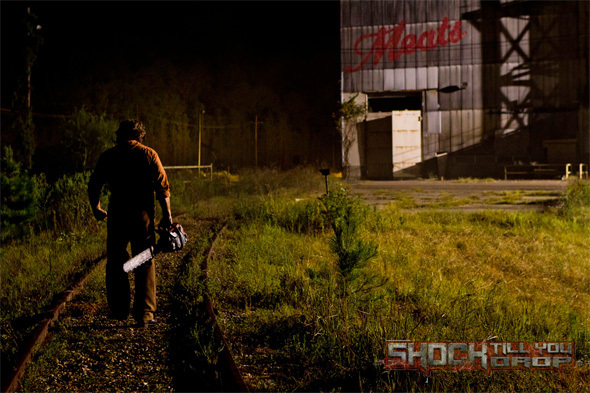 We just got a second teaser poster for Texas Chainsaw 3D, the sequel which continues the legendary story of the homicidal Sawyer family, picking up where Tobe Hooper’s 1974 horror classic left off in Newt, Texas, where for decades people went missing without a trace. After the last incident, a vigilante mob of enraged locals surrounded the Sawyer stronghold, burning it to the ground and killing every last member of the family – or so they thought. Now the first official photo from the film has surfaced, and it makes me think this footage should have the sad theme from "The Incredible Hulk" playing along with it. Photo below! No I coulda sworn it was Michael Myers at a first glance...no wait "zooms in" ah it's just a stereotypical serial killer nothing to worry about! Out of the most iconic and recognizable franchise villains he is my favorite. This better be good. Ethan should give him a hug.